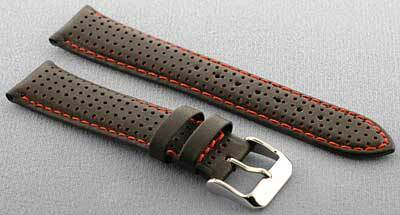 This black leather racing strap has red stitching. Stainless nickel free buckle. 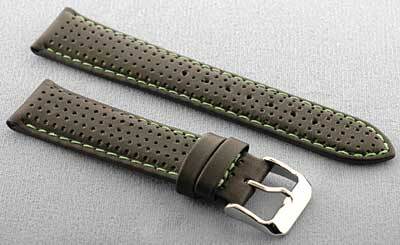 This black leather racing strap has green stitching. Stainless nickel free buckle. This yellow leather racing strap has black trim, keepers and stitching. Stainless nickel free buckle. 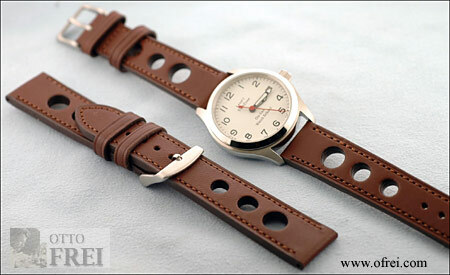 The Buckle end is 2 7/8 (72 mm) inches on this strap, while on the other end the first hole is at 1 7/8 inches and the last hole is 3 1/2 (90 mm)inches. 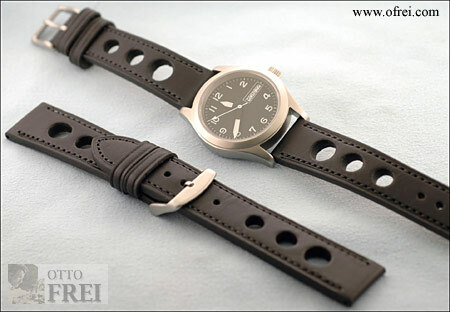 This straps takes a 18 mm Buckle. 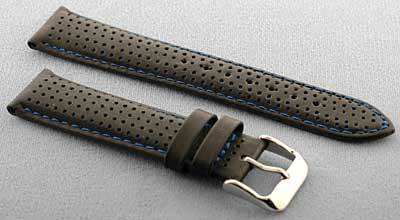 This black leather racing strap has blue stitching. Stainless nickel free buckle. Rugby leather is as tough as any top flight rugby player. Multiple air holes allows your wrist to breathe and your now ready for mountain treks, driving at the race track, going on safari or anything else you can think of. Buckle size is 16 mm, buckle end of strap is 2 7/8 " long and the 1st hole on the hole end is at 2 1/2 " the last hole is at 3 3/4 inches. Rugby leather is as tough as any top flight rugby player. Multiple air holes allows your wrist to breathe and your now ready for mountain treks, driving at the race track, going on safari or anything else you can think of. Buckle size is 18 mm on this 20 mm case lug width strap, buckle end of strap is 2 7/8 " long and the 1st hole on the hole end is at 2 1/2 " the last hole is at 3 3/4 inches.